Every bit counts … Thank you! JMF recently received an email from Greg who has reached out to us to set up a regular donation on his behalf to the Foundation. Greg shared with me the inspiration behind his generosity and I felt compelled to share it with all of you. A face filled with joy! Meet 7 year old Aliya with a face filled with joy and a smile to brighten anyones day. Aliya lives at home with her father, adores school and playing with all of her friends. 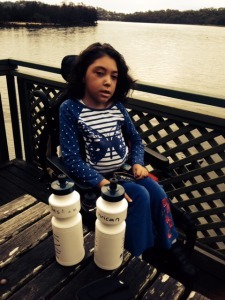 Aliya’s has Cerebral Palsy and her condition affects all of her limbs which makes her unable to sit, stand or walk without the use of equipment. 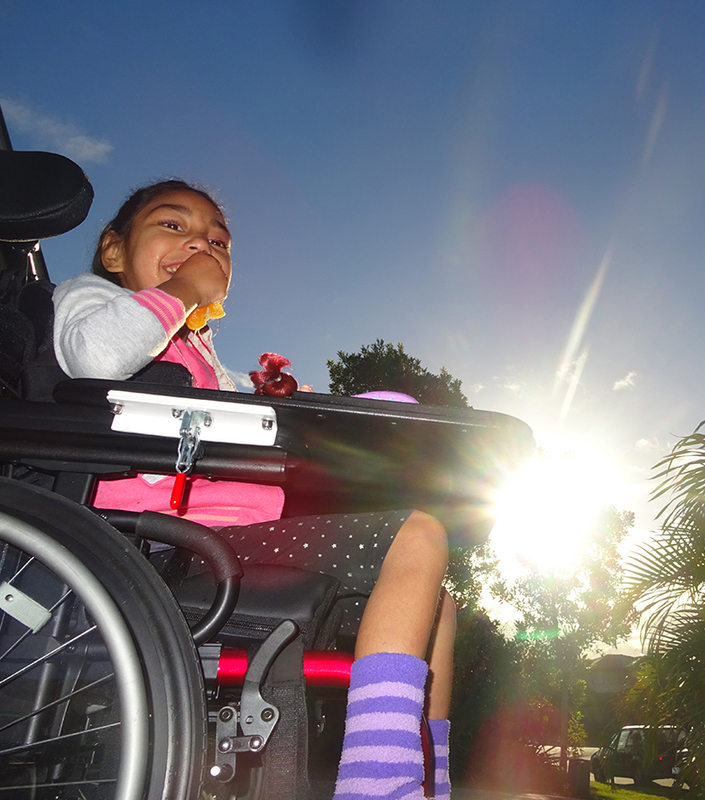 Aliya relies on a manual wheelchair to access both her home and the community and due to the amount of time she spends in it, it is imperative that the wheelchair is comfortable and supportive of her complex postural needs. When Aliya is well supported in her wheelchair, she does not have to work to hold her body up and is able to focus her energy on the task at hand, such as completing her school work. Schooling is an important part of Aliya’s life and one that she loves as she is incredibly aware of her surroundings and craves continual cognitive stimulation. Aliya is currently borrowing a chair from CPL which does not cater for her individual and postural needs. 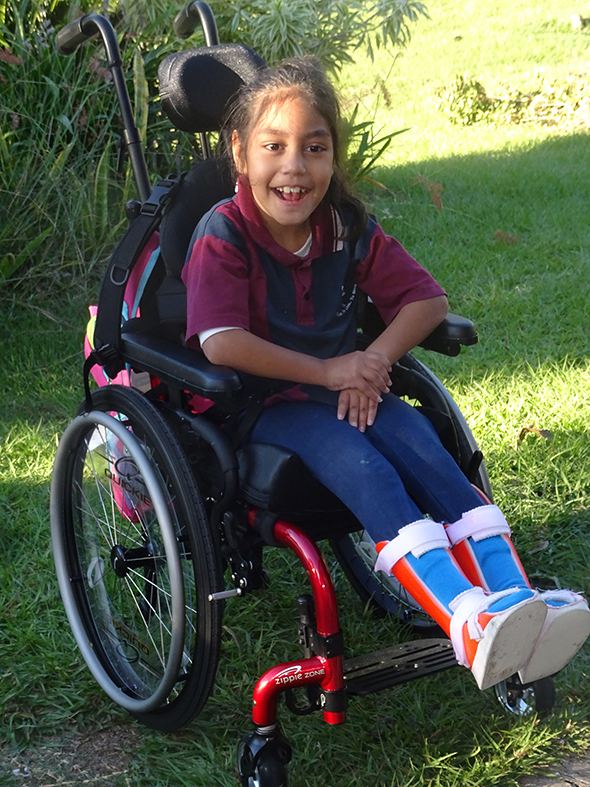 JMF is assisting to fund a manual wheelchair which will not only allow Aliya the freedom to move independently within her environment but also provide her the opportunity to actively participate within the community. Aliya and her family are one of the six families who will be receiving Grants at Hotel Urban in Brisbane on Thursday where we will be giving away $15,000. These Grants are made possible through your donations and with the help of JMF supporters like Accor, Hyundai help for Kids and Hotel Urban. You can use your change to change the lives of young Aussies like Aliya by donating today. 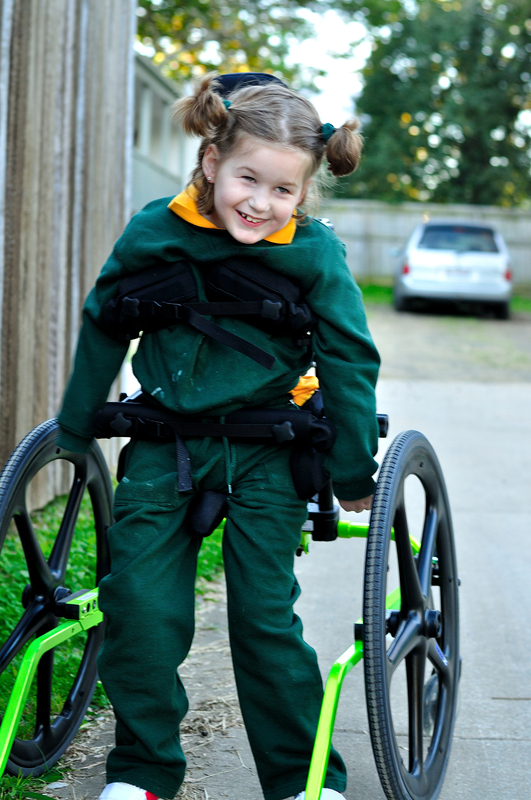 A chair that is correctly suited and fitted to Aliya’s postural and support needs will positively impact her everyday life and ensure her future remains as bright as her smile. Hannah is a beautiful 11 years old girl who lives with her parents and younger sister. She is not able to walk without equipment as pictured below and is always seen scooting around in her manual wheelchair. Currently Hannah’s bathroom is not very accessible for her and a temporary ramp and platform have been arranged to allow her mother to push her into the shower using a her mobile shower chair. Unfortunately this arrangement is difficult due to the small space available, which makes what should be a relaxing experience a potentially dangerous one. On June 25th at Urban Hotel Brisbane JMF will be granting Hannah and her family bathroom modifications that will change this arrangement and create an easily accessible and safe shower area, which will change their lives. 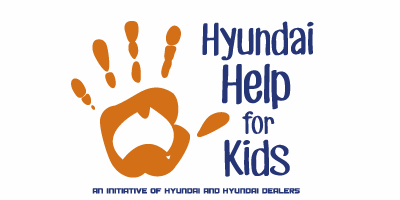 These grants cannot be given without the generous support of partners like Accor Asia Pacific, Hyundai Help for Kids, all the participants of JMF Kids 4 kids 2014 including the support of Boost Foundation. Hannah is always full of smiles and JMF is looking forward to changing her life. YOUR CHANGE CAN MAKE A CHANGE! Just one sacrifice in our everyday lives can go a long way towards changing the life of a young Australian in a wheelchair with the added BONUS of another claim in your tax return for 2015. The end of the financial year is nearly here. Donate now and get the benefit of changing the lives of young Australian’s in wheelchairs with the added BONUS of a tax deduction. 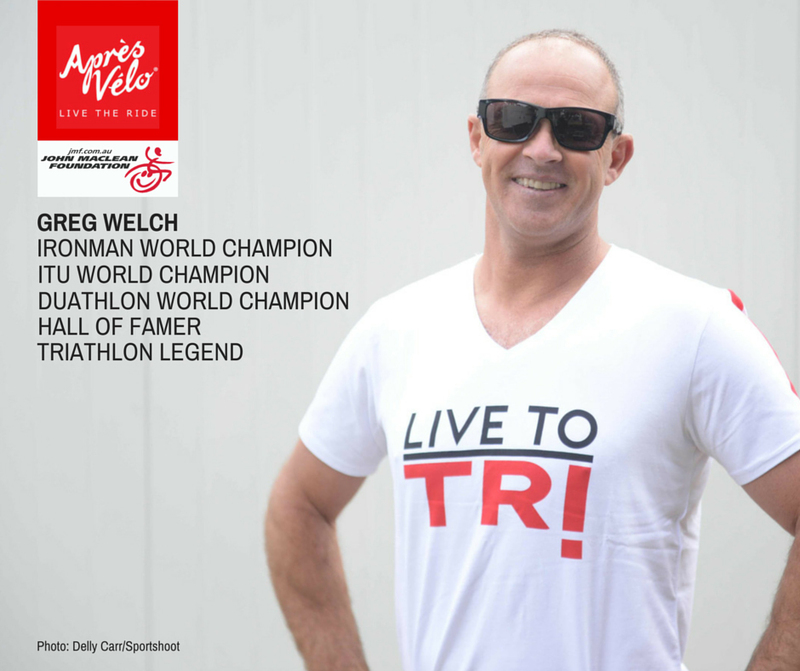 IRONMAN World Champion, ITU World Champion, Duathlon World Champion, Hall of Famer, Triathlon Legend and all round AWESOME Aussie Greg Welch support JMF. Greg is acknowledged as one of the greatest triathletes due to his remarkable dominance in winning the “The Grand Slam” which includes the ITU Triathlon World Championships (1990), The Ironman World Championship (1994), the ITU Duathlon World Championships (1993) and the Long Course Triathlon World Championship (1994). Thanks for your support of The John Maclean Foundation. 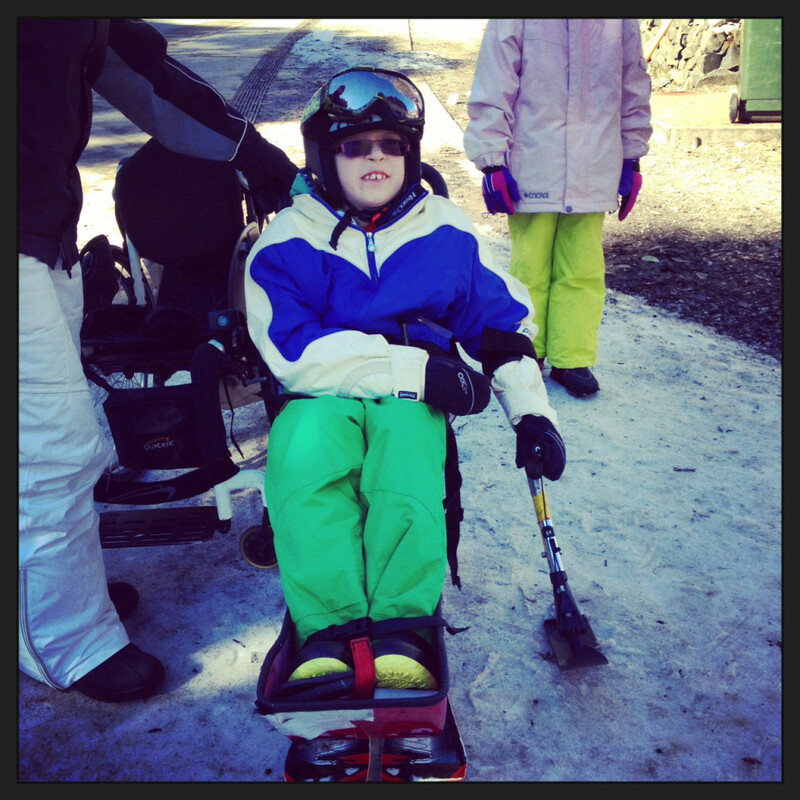 Unstoppable Aaron is an outgoing 13 year old boy who suffers from Spina Bifida (GMFCS 111), hydrocephalus and epilepsy which limits his ability to be independently mobile and risks falling and seizures. Despite this he regularly participates in sit-skiing, fishing and playing in the back yard. He has an incredible smile loves to live life and experience all manner of things. Aaron keeps his parents fit and young’s they try to keep up with him. Aaron is going camping to Central Australia with his family and needs “FreeWheel” attachment for his chair to enable him to participate in all outdoor activities without mobility restrictions. With this “FreeWheel” attachment he will be able to take his chair across the rugged terrain he will encounter in the Outback and experience the beauty and magic of Central Australia with his family. We wish Aaron and his family a wonderful holiday. Our fantastic partners Hyundai Help for Kids have given Aaron and his family passes to the Quarter Final of the Cricket World Cup Final on March 18. We look forward to sharing some pics of this very special day and experience with you. 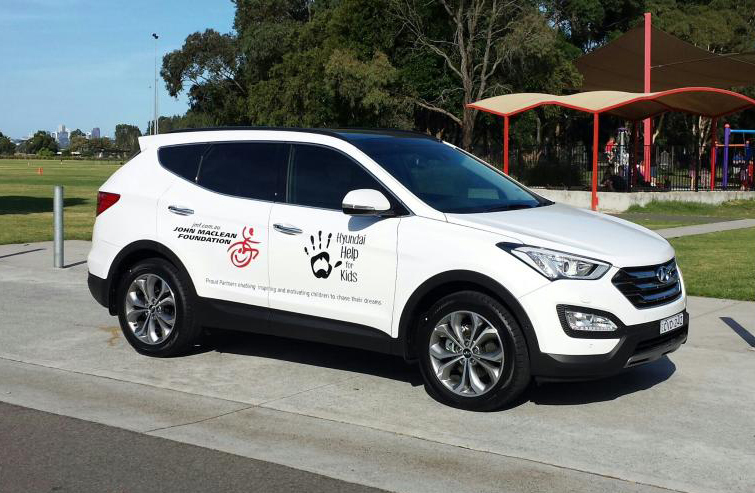 As a part of our partnership with Hyundai Help for Kids, the John Maclean Foundation not only receives $25,000 but also fleet support. will assist the John Maclean Foundation to increase Brand awareness on a day to day basis and create a focal point at our Events across Victoria and NSW. Check out the great looking Hyundai Sante Fe SUV. Make sure you look out for these cars on the road in Victoria and NSW. This Friday November 21 at Sofitel Sydney Wentworth The John Maclean Foundation will be presenting $25,000 in Grants to four young Australians in wheelchairs and their families from the generous donation by ACCOR Australia. The Grants we will be presenting will include car modifications, back supports, wheelchairs and other chairs to assist in making the lives of these little Aussies easier and enable them to remain included in their every day lives. 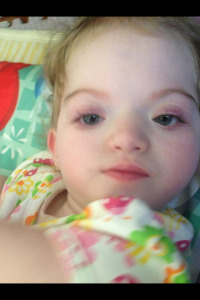 One of the little Aussies joining us on Friday is three year old Addy, a little girl who has a suspected diagnosis of Antley Bixler Syndrome (malformations and deformities affecting the majority of the skeleton and other areas of the body) and has very complex medical and equipment needs. Addy is a full time wheelchair user and has recently undergone hip and knee surgery, joint problems result from uneven tone throughout the body and non-weight bearing. Following her surgery Addy will be in a brace to keep her legs abducted and is positioned on the floor and in a rigid seat during the day. Addy will greatly benefit from the Special Tomato floor sitter, which is like a seat on wheels, to provide her with comfort and support while recovering from surgery and provide Addy with support when on the floor to allow her to play with her brother. The base will also allow Addy to move through the house easily with her parents and brother to ensure she is involved in activities at home. Another young Aussie joining us is Destan who is 11 years old and has congenital centronuclear myopathy a deteriorating condition resulting in muscle weakness and fatigue. She is a part of the JMF family already with assistance with car modifications some time back. It is great to be able follow up and help her as she grows. Destan underwent spinal surgery this year for a severe scoliosis and spinal rotation following surgery she became very unwell and had an extended hospital stay. We are providing a Quickie Iris tilt-in space – Manual Wheelchair to Destan as her powered wheelchair limits her access on family outings and holiday’s as it requires so much space. She recently had to borrow a manual wheelchair to be able to attend her sister’s birthday party. Destan is starting High School next year and the V-Trak Seating System we are providing can be used in both her powered and manual wheelchair, which will give her the appropriate support to ensure that she is comfortable and can concentrate on her education as well as increasing her access to social situations. It is going to be an incredible afternoon and we are looking forward to sharing it with ACCOR Staff and Management. URBAN is more than a Hotel – They are huge supporters of JMF! [vc_row][vc_column][vc_column_text]URBAN Hotel Group have supported The John Maclean Foundation for years and over that period have generously Donated so much which has helped Little Aussie Wheelies across Australia. Urban is much more than a hotel Group they are HUGE supporters of JMF. More style. More comfort. More for you. Urban is more than a Hotel Group. We’re strong on vision, designer style and modern comfort, and you’ll discover that everything from our signature Urban Snorer beds to our tasty in-house fare is designed to suit you. Whether it’s the beach bars and bands in St Kilda, the leafy north shore of St Leonards, or the sweeping city views in balmy Brisbane, Urban will always offer you more. Try us. You’ll be delighted. To book visit hotelurban.com.au or call 1300 610 366.